Barletta is a town of Apulian origin, defined by scholars as the wharf of Canosa. Several sources from the Roman period cite it as Bardali, Baruli or Bardulos. The town began to expand in the Norman period and became an important economic and military centre. During the period of the Crusades, its geographical position made it the main port of exchange with the Orient. During the Angevin period the town preserved its extraordinary riches, but the peak of its fortune is linked with the Aragonians and the Kingdom of Naples. In 1503 a quarrel between French and Italian soldiers led to the famous duel in which the Italian knights, led by Ettore Fieramosca, defeated the French. Between the 17th and 18th centuries, a series of disasters, which included earthquakes and plagues, marked the town's decline. It did not recover for two more centuries. During the two World Wars, Barletta distinguished itself for bravery and was awarded the Medaglia d'Oro al Merito Civile for its resistance against the German troops. 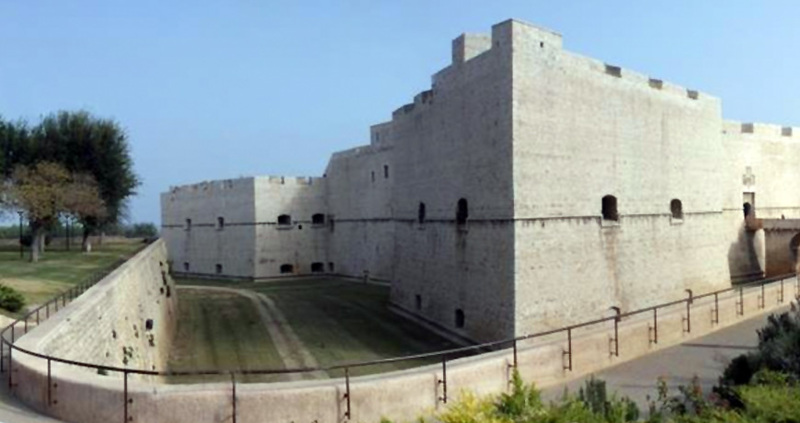 Barletta offers its visitors an unforgettable spectacle of artistic beauties and monuments. These begin with the Castello, constructed during the Norman period. Four corner ramparts were later added by Carlo V. The cathedral, dedicated to Santa Maria Maggiore, is extraordinarily beautiful. It is one of the four Palatine basilicas in Puglia, erected in classic Puglian Romanesque style in 1140 and later remodelled in Gothic style. Inside there are various interesting works, including a table with the Redentore or the Redeemer on one side and a Madonna with child on the other. On the left side there is the campanile, furnished with one, two and three-columned windows, and with a bell tower which was reconstructed after the earthquake of 1743. Another important church is the Basilica del Santo Sepolcro, also of Romanesque origin but reconstructed in Gothic style in the 13th century with Burgundy influences. Inside there are 14th century frescoes and a Byzantine table of the Madonna di Costantinopoli. Also worth visiting is the famous Cantina della Disfida. According to the tradition this was the place in which originated the dispute between Fieramosca and the Frenchman La Motte which led to the famous duel. The most traditional festival is that relating to the anniversary of the duel. Every year the event is reconstructed by characters dressed in clothes of the period. The festival is accompanied by many cultural and celebratory events, including conferences, exhibitions, wine and food events and Renaissance dinners. Another fixed event is that of l'Estate Barlettana which takes place in summer. Throughout July and August there is music, dance, theatre, cinema and various other performances.